My favourite sandwich is a complicated yet classic one. 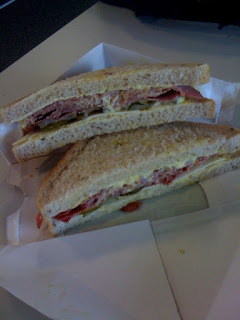 You need plenty of pastrami, sliced gherkins, mustard mayonnaise, emmental cheese and sauerkraut for filling. To force all this between, you need two slices of thickly cut rye bread that's been baked with caraway seeds. New York delis are famous for making sandwiches like this, but closer to home, you can get really good ones at Marks and Spencer. When I went to Germany last year, I saw that rye and caraway bread is something that's consumed fairly often, and it got me thinking about how the flavour combination could be applied to beer. Beer being liquid bread, rye being an easily obtainable brewing malt and caraway seeds being so aromatic; I think it's a combination waiting to happen. So, the next beer I brew will be a rye and caraway seed ale. The grist will be simple: eighty per cent marris otter and twenty per cent malted rye, hopefully allowing the rye to shine through and be the dominant malt character. I want the other dominate flavour to come from the caraway seeds, so the hopping will be very limited. Bittering with fuggles to around forty IBU's and then a small late addition of fuggles to give a herbal, spicy, grassy background. Caraway seeds will then go in at flame out and will also be added to the conditioning vessel when primary fermentation is complete. Yeast will come in the form of US05 to make it as neutral as possible, and to keep sediment nice and compact. As far as ABV, I'll pump for something in the range of five to six per cent, meaning an OG of about 1055. I'll post an update when I get to the brew day, but there you have it; a strong ale with the flavours of rye and caraway seed. Something a bit different and unique, but why not? Enjoy with emmental cheese, pastrami and gherkin. When I was brewing at dfh the brewers get to go to the pub and brew whatever they want for the most part. When it was my turn I brewed 150 gallons of a pumpernickel porter with caraway seeds. Even dry caraway'd it. I was pretty happy with how it turned out. Could have used some more caraway flavor though. http://www.dogfish.com/brews-spirits/the-brews/brewpub-exclusives/daily-wry.htm Here's a link to the description I wrote of the beer for the web page. I wanted to call the beer "devil's fart" because that's what pumpernickle means in old German according to wikipedia but Mariah wouldn't let me name it that. I've been meaning to make it at home as it was two years ago when I brewed it. Let me know how yours turns out. Cheers! Just had a look at your descriptiong and that Pumpernickel porter with caraway seeds sounds delicious! Sounds like I had a similar idea with the inspiration being a bread. I'll definetly post a follow up blog or two about it, so keep an eye out for that. With it being a bit experimental and the first time I've tried it, I don't expect it will be without faults. Any tips for dry hopping with the caraway seeds? The only sandwiches I've ever seen at M&S are made with exceedingly bland white or brown sliced bread. Where are these amazing deli rye concoctions to be found? They used to be a special but they're part of the main range now. I'd say 90 per cent of M&S shops have them, they just probably sell out pretty quickly over a lunch time. Like out for them, you shouldn't have too much problem finding one. The M&S version is more about the filling that the bread though. The bread they use isn't a patch on the German version.